Sick of seeing little girls' cardigans yet? I nearly am... but fear not, although there are more coming, we are almost there! Anyhow, these mitts were a welcome change of scene. 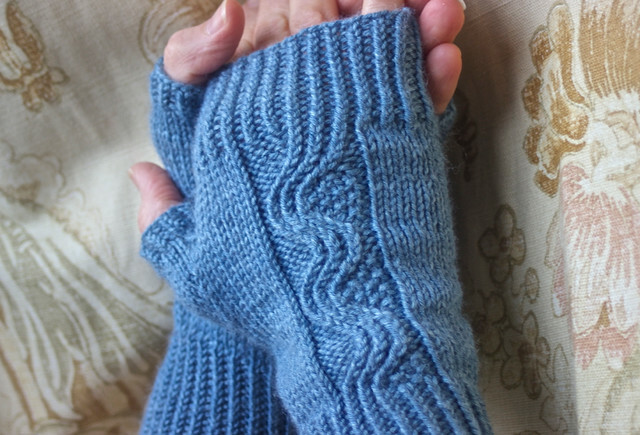 They are the very lovely Nalu Mitts by Leila Raabe and they're a free pattern on ravelry. If you fancy some fingerless mitts for yourself, or fancy making them for someone else, I can highly recommend these. They are fast and interesting without being too tricky, so you can watch great subtitled Danish TV like The Killing, and not miss a beat. The new series is as gripping as the first two and if you haven't seen any yet, do. If only for the great sweaters. I modified the pattern only a little, by lengthening the cuff to two inches and by casting on two extra stitches when picking up stitches at the thumb hole and knitting them together with the corner stitches, to avoid the little holes on either side. Oh, and I ditched the pesky cable needle. My ravelry project page can be found here.